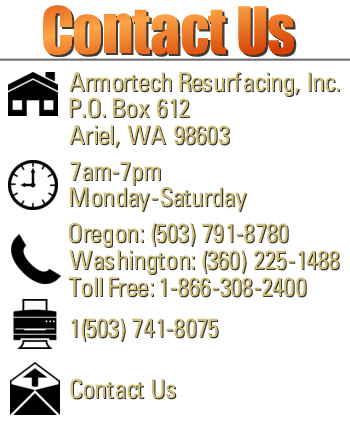 Armortech Resurfacing Inc. is a full-service specialty coatings contractor serving both Oregon and Washington. 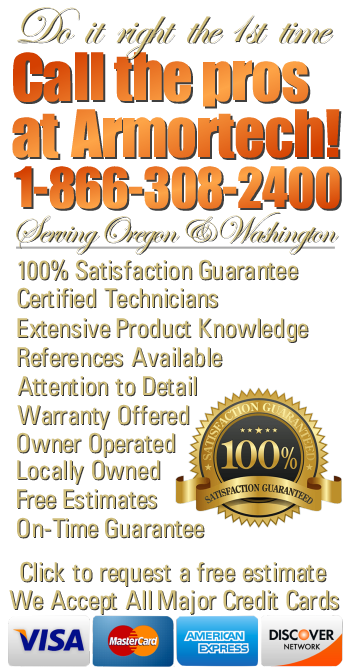 Our service area includes the greater Portland-Vancouver metro area, the North Oregon Coast and everywhere in between. We specialize in the application of high-performance epoxy coatings and industrial strength polymers over a variety of hard surfaces, including concrete, fiberglass, porcelain, laminates, acrylics, metals, and more. 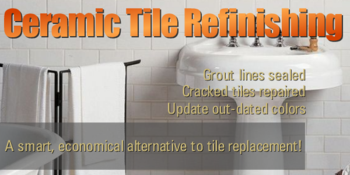 We install a variety of premium seamless epoxy flooring systems, custom epoxy garage floor coatings, interior and exterior decorative concrete overlays, artistic concrete engraving, and staining; as well as providing a full spectrum of kitchen and bathroom refinishing services including shower and bathtub refinishing, sink, vanity, and epoxy countertop resurfacing. 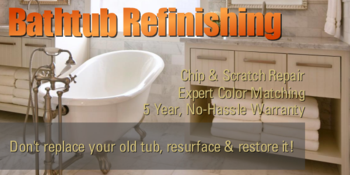 Our team of friendly, manufacturer trained, certified applicators and installers are experienced and knowledgeable in all aspects of interior and exterior surface refinishing and restoration. At Armortech, we provide a broad selection of custom solutions to make your home, or business more valuable and more beautiful, all while delivering you the highest quality craftsmanship and products from the best manufacturers on the market today. Please take a little time to look through our site and feel free to contact us if you have any questions or would like to schedule a free on-site consultation. We look forward for the opportunity to earn your business. Give us a call at 1-866-308-2400, and let's talk about the scope of your project. Once found almost exclusively in five-star hotels, resorts, and luxury cruise lines. 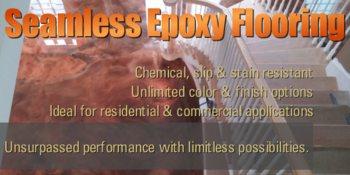 Today, many discerning homeowners and savvy business entrepreneurs are incorporating these high-performance epoxy products into their restoration and renovation projects. 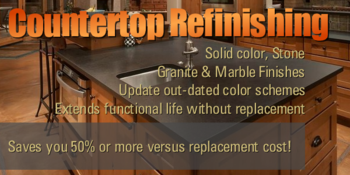 And, not only for their unique beauty but also due to their superior performance, high durability, ease of maintenance, and often substantial cost savings versus other more traditional alternatives. At Armortech we pride ourselves in providing innovative products and state of the art, cost-effective solutions to meet our clients varied needs and specific demands. 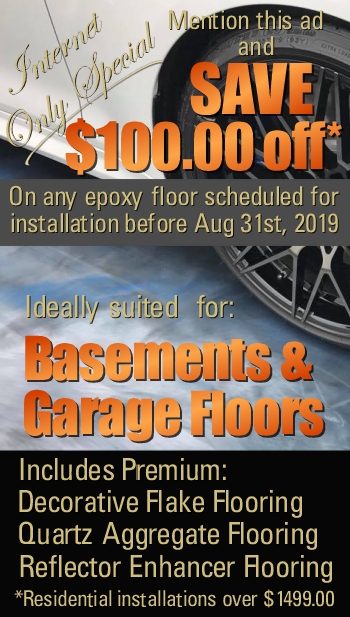 Whether you are a homeowner ready to beautify and transform the dull concrete slabs in your basement, garage, or driveway with a decorative epoxy floor, or a stained, stamped, or stenciled decorative concrete overlay. 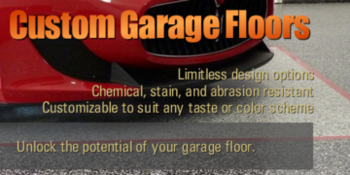 A small business owner with a desire to increase your brand and the visual appeal of your business with a one of a kind seamless metallic epoxy floor, branded with your own unique engraved or inlaid business logo. Or, a hotel/motel management company with units in need of modernizing outdated countertops, bathtubs and shower surrounds. We have the expertise, equipment, and people to make it happen in a timely, affordable, and professional manner. 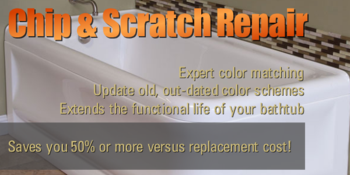 Armortech Resurfacing is family owned and operated, and we strive to meet or exceed the same high standards of quality, craftsmanship, and professionalism we ourselves would expect when hiring a contractor. We pride ourselves on providing our clients with the best possible customer service, from initial contact through final project completion. We understand the importance of communication and promise to take the time to listen to your questions, address your concerns, review the unique site conditions and provide you with a custom, site-specific solution to fit your needs, design style, and taste. Beyond that, we guarantee our trucks and crews will arrive at your location on time, properly trained and equipped, ready to perform the necessary and proper preparation, application, and cleanup required to ensure your complete satisfaction and that your restored surfaces withstand years of use. A statement we back up with a written warranty. Please feel free to contact us if you have any questions or would like to schedule a free on-site consultation.